We are manufacturer and exporter of Temperature Detectors & Thermocouples such as rtd thermocouple, thermocouples, chromel alumel thermocouple, mineral insulated thermocouples etc. These are manufactured in compliance with the DIN standards. We manufacture and export an extensive range of Thermocouples RTDs, which has in-built property that the electrical resistance of metals varies with temperature. These are basically sensor or platinum resistance thermometer, which is manufactured in compliance with the DIN standards. The device is also available with adjustable adaptor in BSP & NPT to ensure better functionality. The extensive range of Mineral Insulated Thermocouples & RTDs offered by us is manufactured in compliance with the set industry standards. These units used in many process and laboratory applications. 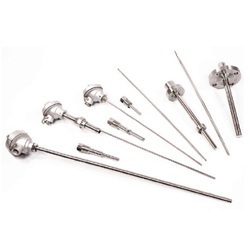 Our range is available in all thermocouple element types, a wide range of sheath diameters and materials. Further, the high temperature ratings make thermocouples perfect to be used for temperature measuring applications. Mineral Insulated Head Type Thermocouples are seamless extruded thermocouples with magnesium oxide tighty compacted around the conductors which enables them to be very flexible them tobe very last response beacause of small diameters. 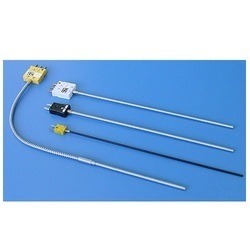 Looking for Temperature Detectors & Thermocouples ?